What is Rose-Hip Vital® Canine? Rose-Hip Vital® Canine is a plant-based anti-inflammatory and immune system support for your dog’s joint health and general wellbeing. It’s is scientifically and clinically proven to reduce inflammation, protect cartilage, improve general health and improve performance. 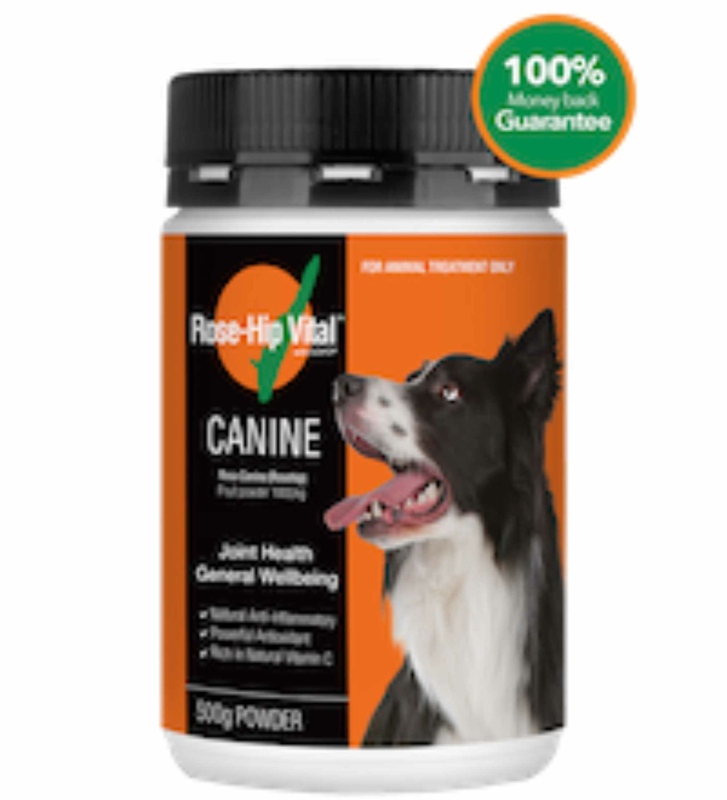 What are the ingredients in Rose-Hip Vital® Canine? 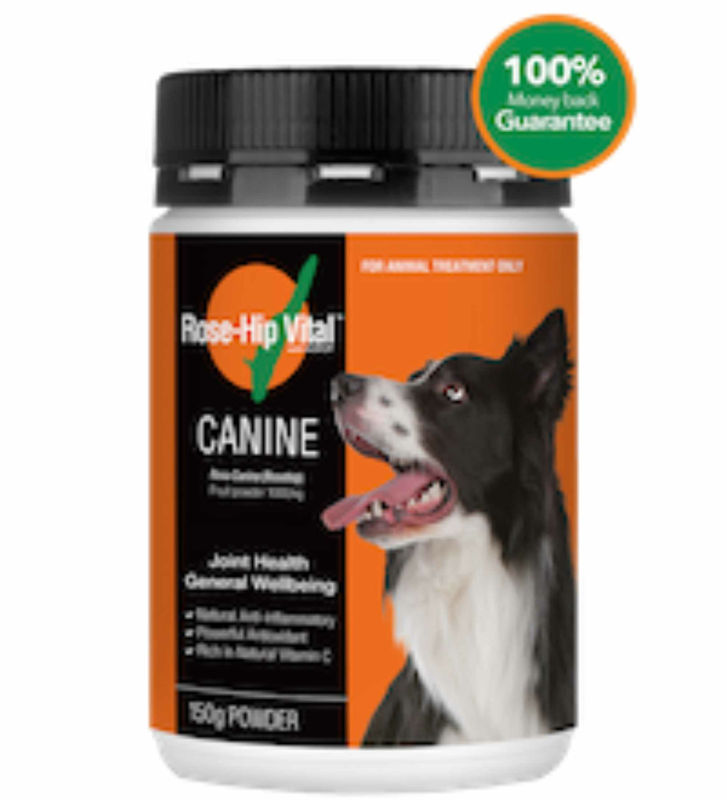 Rose-Hip Vital® Canine is made from pure and natural rosehips manufactured with patented extraction and drying processes. Nothing else is added. What is the active compound GOPO®? Patented extraction and drying processes isolate and activate a galactolipid/fatty acid called GOPO® which has scientifically proven anti-inflammatory and antioxidative properties. GOPO® works by stopping excess white blood cells from gathering around inflamed tissue, thereby breaking the cycle of inflammation and protecting cartilage. Rosehip products that do not contain GOPO® have not been shown to have anti-inflammatory properties.To watch a short video explaining how GOPO® works click here. Is there natural vitamin C in Rose-Hip Vital® Canine? Yes. Rosehips are known to be one of nature’s richest sources of natural vitamin C. The patented processes used to manufacture Rose-Hip Vital® Canine maintain the integrity of the natural vitamins and minerals found in the Rosehip. The vitamin C in Rose-Hip Vital® is 100% natural and therefore absorbed more effectively then synthetic vitamin C. 2.5g of Rose-Hip Vital powder contains 12.5mg of natural vitamin C.
After approximately 3 weeks your dog should start to feel positive effects. What evidence is there that Rose-Hip Vital® Canine may help relieve joint Pain? 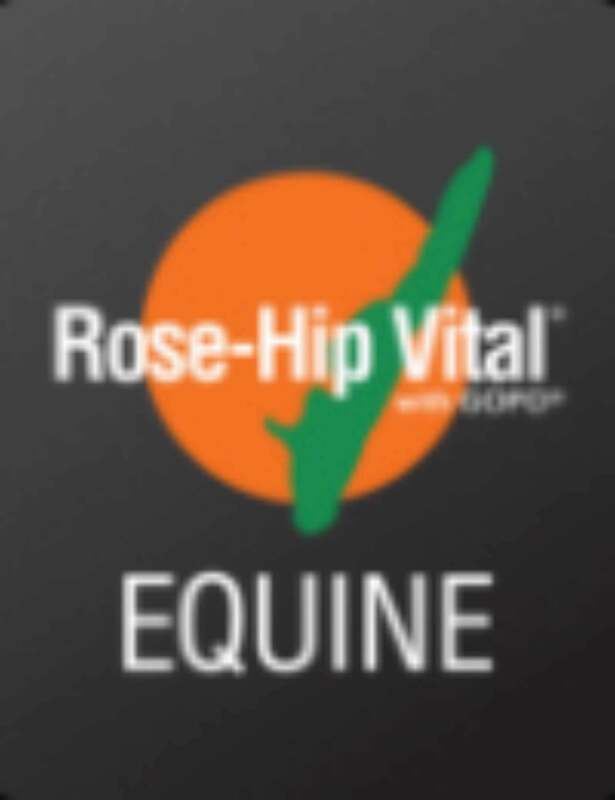 Does Rose-Hip Vital® Canine support general health and wellbeing? There are no known side-effects and Rose-Hip Vital® Canine is shown to be well tolerated. Yes, Rose-Hip Vital® Canine does not interfere with prescription drugs or other supplements. Always consult your dog’s healthcare professional. Simply mix Rose-Hip Vital® Canine powder into your dog’s food. Do not mix with hot food or hot liquid. Is Rose-Hip Vital® Canine safe to give to dogs with a sensitive stomach? Yes, however, we recommend introducing the product gradually to ensure tolerance. We recommend veterinary consultation if your dog has a medical history of stomach sensitivity. Does it contain yeast, gluten, wheat, dairy, sugar or lactose or nuts? No. Rose-Hip Vital® Canine is 100% plant-based.